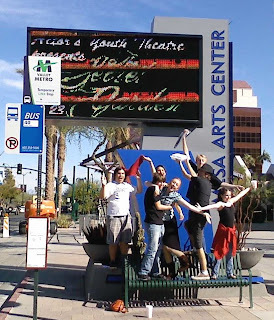 Our Happily Ever After: "Come to My Garden...."
We're on the Marquee at the Mesa Arts Center!!! Ok so this past week has benn INSANE! Show week is always crazy, fun, stressful, fun, long nights, fun, etc. with actors 8-19 and they look awesome! This last show will definitely have a very special place in my heart and soul. but these guys made it come alive and touch every heart in the audience. Last night I was finally able to sit and watch the entire show from beginning to finish. and "Race You to the Top of the Morning". The entire thing got me to tears though. BUT I realized that I was still part of it. Just not in the spotlight. that these gifted actors go through. What was truly amazing was that we were at the Mesa Arts Center! a real live box office and ushers and all! Thank you so much for letting us come and perform there!!! The crew was amazing and we loved them! The leads in this show were so great. Adriene you are just too amazing and truly are a princess. Made me cry every time you walked out. you are one awesome kid! and now you have grown into such an amazing young man. Nick. You serious thing you. Yes you made me cry every time you sang "Lily's Eyes" and you can be proud of that. you embodied it with every fiber of your being. Both of our wonderful Sophia's. Sophia O'Malley you are such a cutie! Your voice is wonderful so keep coming back and singing for us cuz we loved you! I love your cute smile and your willingness to do everything. Sophia Deyden you are gifted child! Thanks for coming and showing us how good you are. You both made Mary real for me. Maddie my dear! You were MADE for the role of Martha. Every day you were amazing and you became your character and I didn't even have to try. Thank you for making it so real and for touching my heart, as well as the entire audience.